A quick post to let you know that I crossed the Channel today in 12:21:00! Will post with details as soon as I can…a little tired right now. OMG OMG OMG you are awesome man!!! F’ing awesome!!!! We have been waiting and this was so worth the wait!!! So excited for you and we just love the picture!!! Can’t wait to hear all the details. You must be on Cloud 9!! I let my mom and dad know too and they are ecstatic! You are unbelievably brave and focused. Nothing can take this away from you. PS: Geoff and I will have a party with the kids tonight to celebrate their uncle Rod’s major accomplishment!!! Now, go celebrate and enjoy some travelling!! Wonderful news! Congratulations!!!! Was a bit worried when nothing had been posted. Time to feast on good food and drink and celebrate with friends and family. I look forward to hearing the whole story. WOO HOO !!!!! I knew you could do it !!!! You are truly an inspiration my friend…..now go sleep, eat, celebrate and travel !!! City Hall is celebrating!!! GO ROD!! Hope you can hear us hollering from North Vancouver! Right on, Rod! You are DEFINITELY da Man now! BOO-YA!!! My 3 year old daughter just said, in response to how long you were swimming for, said you were slow! LOL! Remember, she’s 3! Of course, I couldn’t imagine doing one thing for 12 hours straight, except maybe sleeping. So, go have a nap now! Hey Mr. Mayor of CNV… Keys to the City??? Rod- send us more pictures and video when you have a chance. On behalf of your sisters, channelling your mother, we are now lighting a figurative cigarette and making a cup of tea. Amazing! Look forward to all the gory details. FANTASTIC NEWS ROD! Congratulations. It must be a bit surreal but it is real. Congrats!!! yay uncle rod I’m so proud of you! my mom was channelling nana last night and is very relieved now! Well done Rod!!! What an amazing feat. CMSS congratulates you Rod! What an acclompishment. Bonnie you must be so proud. Have fun now. Enjoy! Way to go Rod! Cheers from all of us at City Hall. Enjoy the celebration! What are you going to do for an encore? Congratulations Rod. How great the feelings must be for you. Now you will not be restricted to swim from only the rocks at the Cap to the Lions Gate Bridge. Rod we knew you could do it and you DID IT! YAY!! Congrats ROD! That is just SO insane to me to imagine you swimming that thing! me and maddy were standing in the ocean the same time you started the swim thinking hmmm.. we are going to go home have dinner go to bed and wake up and you’ll still be in the water… YAHOOO that is an accomplishment only the tiniest fraction of people on the PLANET can say they were a part of! truely amazing great work rod! we all knew you would do it! NOW the question is… what body of water is next? Easy Chicken…!!! Awesome accomplishment!! CNV is buzzing with the great news. Congratulations! Congratulations from all! We’re so happy to hear that you made it. You’re an incredible athlete. Now you can relax and enjoy the rest of your time away. Warm regards from the CMSS team. Congratulations ROD!!!! Amazing accomplishment.!! I am so proud of you! CONGRATULATIONS ROD!!!! So proud of you and your accomplishment today. Bring out the Champagne to share with Bonnie because we are in awe of your achievement. There’s leaping and hugging and shrieking going on in the Department! We are all overjoyed for you. Look forward to hearing all about your swim of a lifetime. AMAZING!!!!!!! What an incredible time too! You look so happy – that’s fantastic. Enjoy this moment! Way to go brother . . . I knew you could do it . . . I’m so proud of you!!!!!!!!!!!!!!!!!!!!!!!!!!!!! You da Man Rocket! Yeah!!!! The yard is cheering right now. Have some cheese, a baquette and some great french wine to celebrate. Just Terrific Rod, Just Terrific, Well Done. Oh, Rod, we are SO PROUD OF YOU!!! Woo hoo! Congratulations on achieving your dream – so many people never even set goals, let alone achieve such lofty ones. Wow. WOW!!!! We’ve all been thinking about you…unbelievable……CONGRATULATIONS!! Gosh that beer (or 6) will go down soooo good. Looking forward to hearing all about it Aren’t you glad that the ferry wasn’t running 😉 Enjoy the rest of your vacation….get out there and have some fun now. Cheers Lynn & the Finance Pose!! Yeehaw!! Well DONE ROCKET!! I am just so happy you made it safe and sound! I can not wait to hear the story! So happy for you, what an adventure. Well done Rod – never in doubt! Bactchelor Bay will never be the same again! CONGRATS! That is just awesome … swimming in BB won’t be the same for you, and swimming at BB won’t be the same for US either … it will be BETTER! What a Star you are!! WOOHOO!!! Man, the suspense was killing us. Talk about cruel and unusual punishment! Way to go, Rod. LOVE IT!!! I am almost in tears!! You are a ROCKSTAR! Congratulations and thank you for being such an inspiration. Huge hugs to you! Did you hear us across the water – we were yelling really loud from the Waterfront Office. Can you get goggles, speedos and caps “bronzed” ? Just a suggestion. You are a water god.. May you eat and sleep to your heart’s content! YAHOOOOOO!!!! Way to go Rod, what a swimming superstar!!!! I can’t imagine what you must be feeling right now….but you must feel pretty darn good! I look forward to more details and stories! CONGRATULATIONS!!! I’m so happy for you!!! You’ve worked so hard for this, and wanted it so bad (i know that’s not proper english!! )… Now, enjoy every second of it. What a great accomplishment! Whoohoo! Way to go Rod! Rod!! Congratulations, we were with you all the way!! You are over the top, have fun now and be merry! I send you lots of cheers Rod. Excellent Rod “of Steel”! You the Fish! I guess that Salish Sea Swim seems pretty easy now! Hmm I bet you are just craving Fish And Chips with lots of salt? NOT! take care and enjoy this incredible accomplishment. Well done Rod. Well done! YOU, are an inspiration – for more people than you probably realize. Ride the wave…I’m sure you’ve had enough of ploughing through them! Kudos to your crew too – a great team effort I’m sure. You’ve made your old man and the entire extended Craig clan proud, particularly by doing the improbable: a double header that will never be equalled – the Strait of Georgia and 17 days later the English Channel – that’s hall-of-fame stuff. And you did it by swimming at Ambleside and Bachelor Bay through April and May in 12-and-13C water. “Congratulations” seems too inadequate a word for your accomplishment. We are proud of you and will probably boast of this event for years to come. To Bonnie: Macy and I will be shopping for clothes soon, have you any suggestions? Rod…..how was the chicken? I ordered some for you from a little restaurant in Calais and asked a local swimmer (Francois) to stuff it down his Speedo and swim it out to you off the Cap. Rod, we are all very proud of your accomplishment. Have a well deserved rest. Just a reminder to watch the emotions over the next couple of weeks. 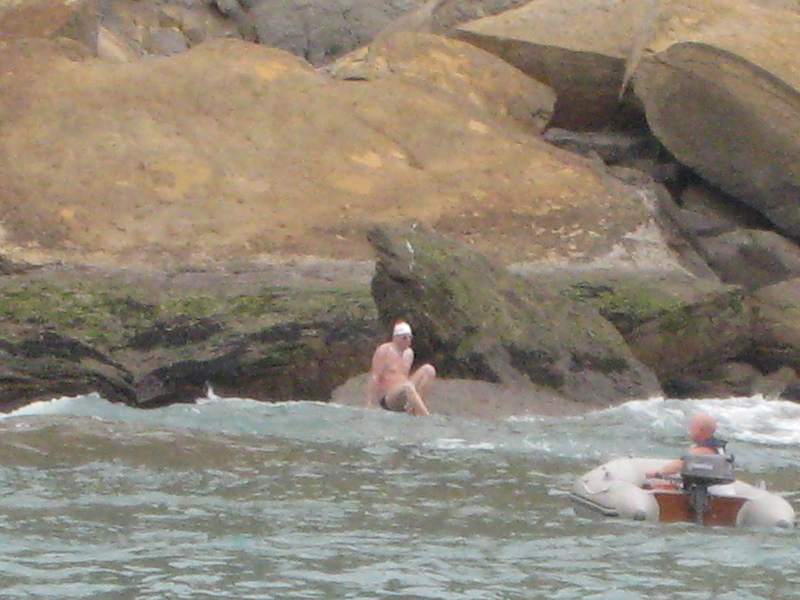 English Channel swimmers have been known to “crash” post swim. Wonderful news, Rod! You made it!!!!!!! I am over the moon for you, and everyone who knows and loves you because we are all ecstatic and inspired by what you have done! You are, indeed, da man! It’s all been said! – you must be on Cloud 9! Enjoy the rest of your trip knowing you just swam the English Channel! That gives me shivers. OMG Rod S P F !! ……………. I am awestruck ! Well done , Bonnie and family must be so proud ! we knew you would do it! All the training worth this moment… We are your very proud mexican friends and send you a warm hug. WOW !!!!!!!!! You did it ! What an accomplishment, we have been waiting to hear. All’s well here at home, Mad & Tim are really enjoying so much time with the doggies. For sure we will have to have you over for dinner to hear all about it, SOON! Take care and have a great rest of your trip! Congratulations Rod! We are all blown away by your strength and determination. You are a true inspiration! David told me today that you made it. That is so fabulous, what a feeling I imagine. 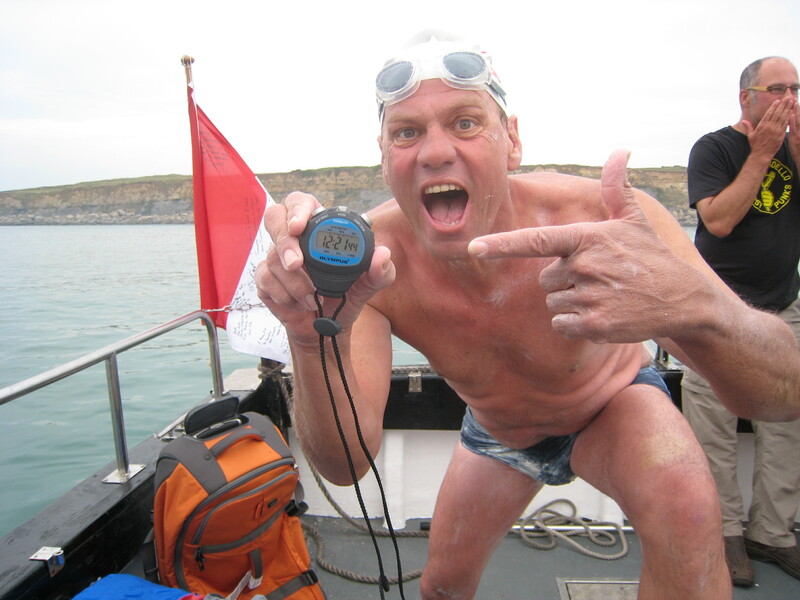 I wanted to tell everyone that I know someone who swam the English Channel today. I guess you can do anything you set your mind to now. That is so great and inspirational Rod. Enjoy the rest of your trip. Hi Rod …. knew the mermaids would take you to the shore!!! A fantabulous achievement!!! Enjoy all the good things life has to offer now that the midlife crossing is done!! Way to go Bendy! I knew you would do it! I am so proud to count you as a friend. Can’t wait to see you and Bonnie when you get back. When do you get in at YVR on the 28th? FANTASTIC. Congratulations. We followed you and Louise Jane all day visually and on internet and are delighted at your success and full of admiration at your achievement. Rod , completely blown-a-way!! Amazing!! You must be so thrilled, you look it in that great photo! Greetings and Congratulations from Liam who was also successful with my Channel crossing on Monday morning. Please let me know if you come to Cork or plan to pass through….there’s a lovely swim in our river here on Saturday …..The Lee Swim…..
We are Channel Aspirants No More ….Members of an Elete Club….and no one can ever take it away from us!!! On behalf of everyone at Cruisers Aquatics, congratulations, Rod and the rest of your team. What an inspiring accomplishment! Way to go Rod! You Rock!!! Awesome job! Well done Rod! Absolutely amazing!! Congratulations from the Lone family! WOW!!! What an amazing accomplishment by an amazing athlete and person!! CONGRATULATIONS – you are an utter legend!! alright well its been over a day since you have landed on the beach and….. we all us! abby is worried… well she would be worried if she ever knew what was going on ever. Just heard – was away on vacation! I will have a rum and coke for you tonight to celebrate your huge success – would you like me to drink out of a red stilleto or black!!! I hope you are on your way to the South of France to relax. You are a inspiration to us all! Wow! An amazing accomplishment by an amazing athlete and person! Outstanding! Good job! We’re speechless and very, very proud of you!!!! Well done! You have made all of us ole timers proud and have set a new standard. Ouch! !Congratulations all the same!! Looking forward to the details and more photos. Its going to be tough to train with a legend. Now I can bask in some more misdirected glory. Well done, I am in awe. Looking forward to hearing the stroke by stroke account. Wow…way to go champ, what a great achievement! You should be very proud of yourself. Rod–Wow–this is the greatest thing that has happened to the family. Congrats–I am so proud of you. Just in case you are trying to figure out who?? Wally’s next door neighbours..Ken and Peggy ..sending you cheers ! WOW ! What a huge accomplishment – one to be very proud of. What a swim, what a moment! I’m at Canadian National Swim Championships with my son. He is very motivated by your feat. Great job. Lok forward to hearing all about it. Congratulations what you have accomplished is truly amazing. What an inspiration you have been to so many people. I look forward to hearing all about your experience when you get back and where your journey will take you next. All the best! I always knew you were world class! Congradulations Rod, it’s nice to have a North Shore boy in the very exclusive English Channel Crossing Club!!! Time to have one of those warm English Beers to Celebrate…. Great job Rod!!! Now comes the real challenge, losing the inspirtional layer of blubber you needed to get across. Congratulations. You are amazing. Your a warrior and your victory is well deserved. Big congrats Rod. A huge mental and physical accomplishment. Dearest Rod, Congratulations to you and your crew!! You are awesome. How you did it I will never know. There is something in you that is not of this world. A truly amazing feat! My favourite number is 2 and you did the swim in 12:21. I liked that as well. Rod, you are amazing! Can’t wait to hear what your next adventure will be. We are so proud of you! Rod, I have no words to express my awe after watching you touch France after your swim across the Channel. It’s an inspiring feat. It was wonderful to have meet you and Bonnie after having heard so much about you. It’s one thing to have worked so hard for 2 years toward such a fantastical goal, but then to have reached it……….it’s truly incredible!! Soak it up (no pun intended) you’ve earned it but…..what’s next???? Whatever it is, you KNOW you can do it!!!! !